Here is a condensed history of the route. It is primarily based on work undertaken by London Transport Museum volunteers using various timetables etc to identify changes to the route and its allocation of buses. I hope to follow up shortly with another post about bus types used on the route. Do get in touch if you want to add something or notice an error or two, I’m no expert! The 213 route from Kingston to Sutton began life as the 113 on 7th September 1921, when a hourly bus ran from Kingston, Horsefair to the Fox, Lower Kingswood via Sutton. The route was a bit different at both ends, Kingston being quite different before the 1960’s ringroad construction, and the route obviously continuing down to Kingswood from Sutton along the Brighton Road, but it still went through Coombe, New Malden, Old Malden, Worcester Park and Cheam. At this time, three buses were used, initially based at Putney Garage (AF) before running from Merton (AL) by October 1921. By January 1922, the route was based from Kingston Garage (K), and no longer served Kingswood, terminating in Grove Road, Sutton. The number of buses used was reduced to two. There were some quite rapid changes to the route, it being first extended to Banstead Victoria in January 1923, and the service between Kingston and Worcester Park partly withdrawn for one month only in January 1924. It was obviously a popular route as 5 buses were in the fleet from January 1923. The route also began to operate from Sutton in 1924 but actually over the span of the route’s existence, buses have started from Kingston, Sutton and Norbiton garages, and kept swapping how much of the 213 allocation of buses came from each. In February 1924, the 113 ran Kingston, Horsefair to Banstead, Victoria and continued to do so until 1930. For a two month period in Spring 1927, the route was split, one section terminating at Balmoral Road, Worcester Park (nearest stop, Lindsay Road), resuming at North Cheam, Queen Victoria due to road works on Cheam Common Road – at least today’s disruptions don’t normally include getting off a bus and a half mile walk…. In May 1930 the route between Belmont and Banstead was withdrawn, the new terminus being Belmont, California. On 1st July 1933, the route was compulsory purchased through Act of Parliament by the London Passenger Transport Board and on 3rd October 1934 it was renumbered the 213, as all single deckers were meant to begin with ‘2’. The first 213 bus was a route operated by Alexander Timpson and Son, between Plumstead Common and Westerham Hill on Sundays only, from March 1923. Similarly, the 213A ran from Lewisham to Westerham, and the 213B from Woolwich to Westerham Hill. They were renumbered the 289, 289E and cancelled respectively in 1934. In 1963, half of the fleet of 213s became 213A and were diverted via Clarence Avenue rather than along Traps Lane, running from Kingston to Sutton or Belmont. In January 1964, it was extended to operate from Wimbledon Station on Monday through to Saturday, and to Morden Station on Sundays from November. This extension was replaced by the 80 and 80A in 1969. The fleet of 213As continued to grow, eventually making the 213 bus redundant in 1978. 213B bus ran for 9 months only in 1964, and was the Sunday service on the 213A route, using 6 RTs split equally between Sutton and Kingston Garages. It ran from Belmont to Kingston on a route very similar to todays. Now, this is when things get a bit mad. On 4th February 1984, the 213A was renumbered ‘213’ and extended to serve, from Kingston to Sutton Garage (Daily), Belmont (Peak hours and lunchtimes, Mon – Fri, until 1990), St. Helier Station (Monday – Saturday, until 1988) and West Croydon Station (Sundays only, until 1990). A slightly unusual diversions included the bus being extended to Ham (BAE works) for one school trip to Beverley School, New Malden in 1990, soon renumbered 213S. There has also been an N213 which connected Croydon to Kingston at night times. This was cancelled by London Buses in 2009 due to apparent lack of use, however, a lively campaign has been set up to get it reinstated. At the same time, the 213 became 24hours and it currently runs with an allocation of 19 vehicles on weekdays, 18 on Saturdays, 10 on Sundays and 3 at night. 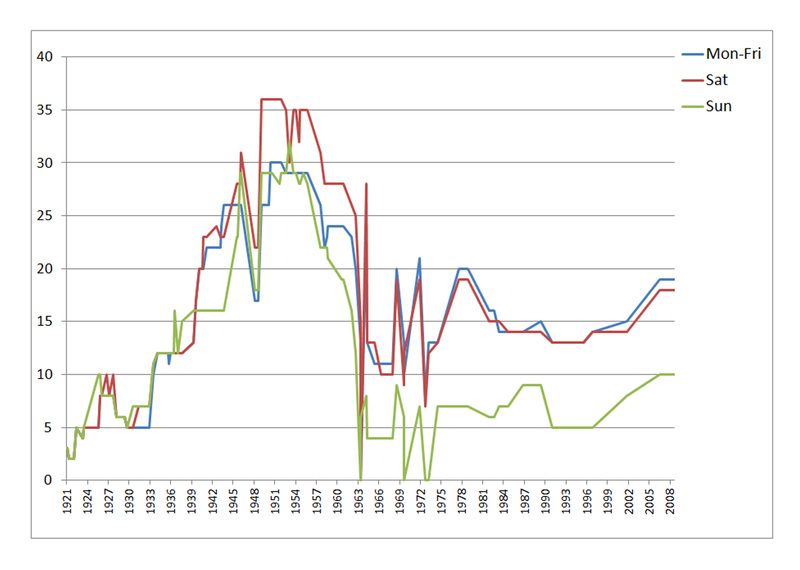 The peak during the late 1940s-early 1950s is due to the Second World and petrol rationing. Today’s allocation is equivalent to that of the 1970s so there seems to be a bit of a resurgence in bus usage. Also, before 1964, buses were single deck (their capacity less, so therefore more buses needed). All in all, I’d wager more people use the 213 now than ever before and I’m proud to be one of them! I lived in Putney 1949-58 then in Kingston 1958-60. In 1951-55 I went to Kingston to study buses that were not RT/RTL/RTW. I rode on T and Q types just before RFs were introduced. It was very obvious that outer suburban routes lost traffic to cars far quicker than did routes like the 74 and 14. Industrial relations were a hot potato.